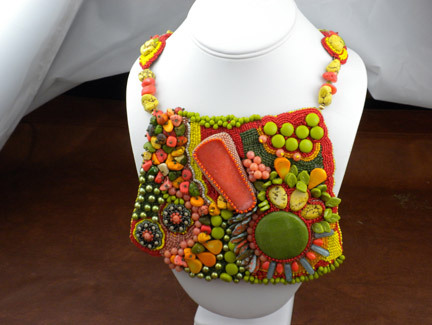 Beading Arts: Marcy Antle's Victorian cuff...and more! I just made this Victorian cuff bracelet over the weekend for a swap partner. I was very pleased with how it turned out, as I have not made one before! It was quite easy (I enjoy hand sewing) and quick to do. I am used to bead embroidery which takes weeks, so this was a dream. Wonderful work - I really like the cuff! It looks like she has a lot of fun making those pieces! OMG, thank you for featuring my work on your wonderful blog - I am truly honored!!! !